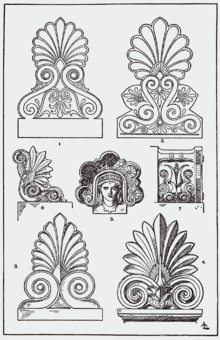 An acroterion or acroterium or akroteria is an architectural ornament placed on a flat pedestal called the acroter or plinth, and mounted at the apex or corner of the pediment of a building in the classical style. An acroterion placed at the outer angles of the pediment is an acroterion angularium (angulārium means ‘at the corners’). The acroterion may take a wide variety of forms, such as a statue, tripod, disc, urn, palmette or some other sculpted feature. Acroteria are also found in Gothic architecture. They are sometimes incorporated into the design of furniture. The word comes from the Greek akrōtḗrion (ἀκρωτήριον 'summit, extremity'), from the superlative form of the adjective akros (ἄκρος, 'extreme, endmost'). It was Latinized by the Romans as acroterium. Acroteria is the plural of both the original Greek and the Latin form. According to Webb, during the Hellenistic period the winged victory or Nike figure was considered to be "the most appropriate motif for figured akroteria". ^ Harris, Cyril M. (1983). Illustrated Dictionary of Historic Architecture. Courier Corporation. p. 5. ISBN 9780486244440. ^ Acroterium at A Dictionary of Greek and Roman Antiquities, 1875. Wikimedia Commons has media related to Acroterion. This page was last edited on 28 January 2019, at 21:50 (UTC).